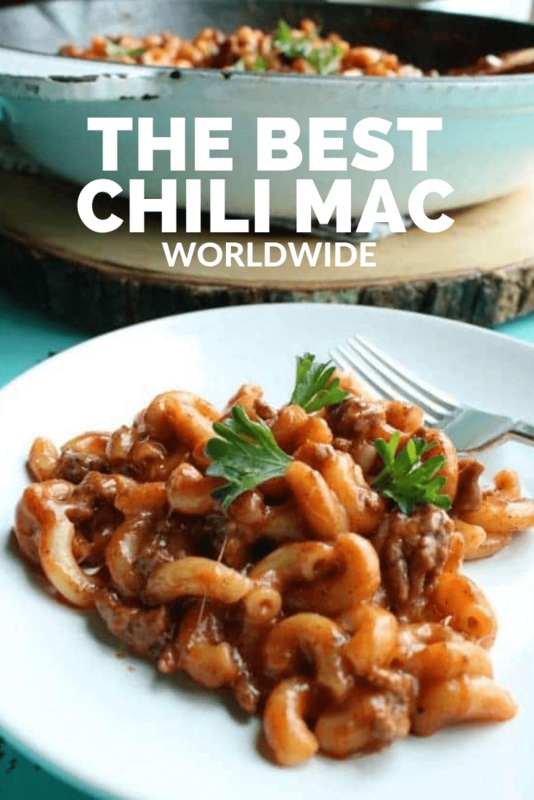 Best Chili Mac Worldwide – This Has Got to Be It! This is it. The best chili mac worldwide. Right here. As one of those cooks who doesn’t like to make the same thing over and over again, I’ve made a lot of recipes over the years. 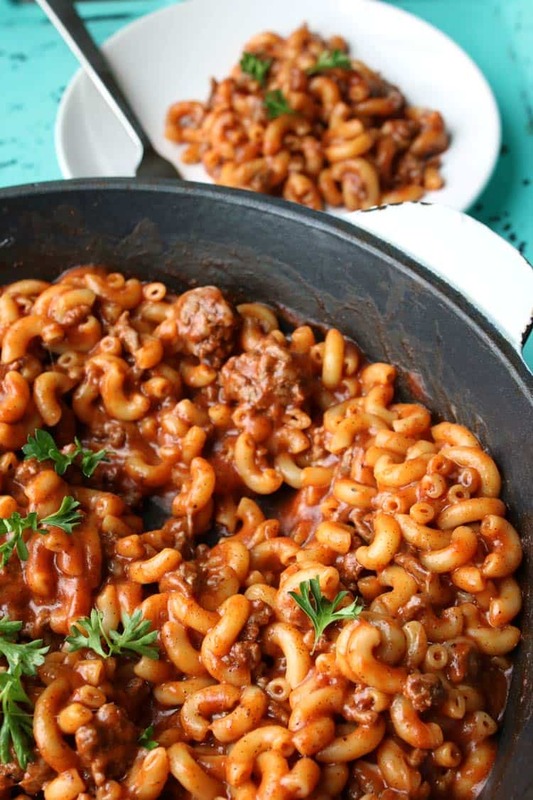 And it has to be said, Chili Mac is one of those soul-warming meals that you’ll want to make more than just once. No kidding. I’m pretty sure you will want to make this recipe again and again. It’s one of those recipes that is super easy to throw together, contains ingredients that you likely already have on hand, and offers a delicious flavor that is perfect to serve up with any type of vegetable on the side. One of the reasons my family loves this recipe so much is because it makes great leftovers. If you’re not a fan of leftovers, you might want to change that. Since our Chili Mac doesn’t make a ton of extra (unless you double it) it is perfect for putting enough aside for one person for work the next day…depending on how deep your family digs into this dish of deliciousness. See what I did there with all those D’s. Yeah…love me some alliteration. Always have. We all need comfort food. Well, maybe we don’t NEED it, but we sure do want it. Comfort food can just make the day better. It can sooth and well…comfort us. And sometimes, that is exactly what is called for. There are so many recipes that fit the bill of comfort. Some of our favorites are our tasty Spicy Sausage Pasta–hello! Or, if you’re looking for a variation of Chili Mac itself, why not try Southwest Chili Mac. OR how about this yummylicious One Pot Chili Mac n Cheese that is out of this world cheesy and delicious? Bad day? Rainy, dreary day? PMSing like nobody’s business? Grab hold of one of our comfort food favorites and dig in deep. If you start to feel comforted while the recipe is cooking, you will know that you’ve found a winner among winners, a king among kings. Because, seriously…cooking can be therapeutic. It can refocus your mind and energy onto something more productive…if you let it. You have to really let all that other stuff go. At least for a little while! And what a productive way to let go? Sure, there is always yoga or running…and those are good in their own right, but to be able to create something delicious in the kitchen and share it with family or friends, is something special. You know what? It’s equally as satisfying if you’re cooking something up for you and you alone and then curl up on the couch with a blanket and a book or a movie. Some days just call for a helping hand of joyful cooking, and our Chili Mac recipe is one of those tasty meals that delivers each and every time. Step #1: Cook macaroni about 7 minutes. Step #2: Brown meat in largest saucepan and drain off all fat. Step #3: Add garlic, chili powder, salt and pepper. Mix well and cook on low about 5 minutes. Step #4: Add cooked macaroni and tomato soup. Heat thoroughly. Step #5: Just before serving, add in the grated cheese. Cover and heat until cheese melts. 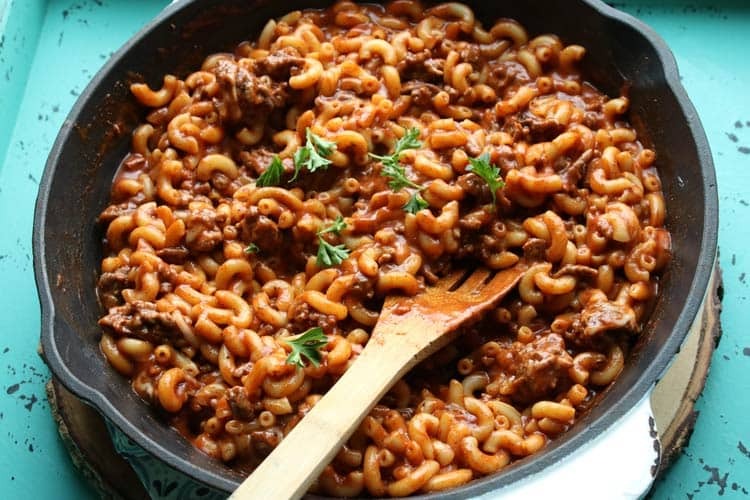 Chili Mac would be great served with a tasty side salad of fresh greens from your home garden, or maybe some steamed broccoli. In all honesty, every single vegetable side dish that I have ever tried with our yummy Chili Mac has always been good. And I’ve tried a lot! There are a number of delicious salads and breads that I like to recommend to pair up with the Best Chili Mac. First and foremost, I particularly love this Italian Chopped Salad. It was shared with me a few years ago now by an amazing blogging friend who really knows her stuff. And let me tell you, this tasty salad is just one of the many delicious recipes that she was generous enough to share with us. Italian Chopped Salad is absolutely amazing paired with anything at all or all by itself. It’s an easy salad recipe complete with a dressing that is out of this world flavorful that you will truly enjoy. To me, its’ reminiscent of my favorite Italian chain restaurant’s salad. If you know me and know how much I love the salad at said restaurant, you know that this is a huge compliment. There is just something about this classic salad that makes it a winner every time we serve it up. As a side dish, or on its own. Now, it’s always a good idea to mix things up a little, and I’m pretty sure that if you enjoy kale you will want to take a bite out of this next salad. For a twist on classic salad greens, try our Blueberry and Kale Salad, it’s a delicious and healthy salad that will balance out your meal perfectly. When you’re mixing up one of your comfort food favorites… in this case our favorite recipe for chili mac…you need to have a delicious side dish on hand. Adding a bowl of our Kale and Blueberry Salad lets you fill up on good for you ingredients before diving into that bowl full of comfort. Which is otherwise know as our main course in this instance. Balancing out a meal with good nutrients is always a good thing, and our superfood salad doesn’t disappoint on the good for you ingredients. You’ll get a healthy helping of vitamins. Comfort food. Dinner. Our main course. Or you can just call it Chili Mac. Really, it will answer to anything. And it doesn’t NEED a side dish, but side dishes are almost always a welcome addition to any table. The trick is to make them work and try to alleviate extra cooking time in the kitchen, especially on days when you don’t have a lot of extra time or are juggling too many tasks at once. One of the things we suggest for those busy days is to make EASY side dishes. It is okay to heat up a can or bag of vegetables instead of making a big to-do with a fancy side dish recipe. Use weekends or a less busy weekday to make a loaf of bread or bread sticks that you can use to serve with meals for a couple of days in a row. You will feel good knowing what ingredients went into the bread and LOVE that restaurant quality taste. You can’t beat this copycat Rosemary Bread or fresh baked copycat Olive Garden Bread Sticks. Our readers rave and rave about both of these recipes, and for good reason. Whichever bread you choose, you’ll find the perfect compliment to go alongside Chili Mac. 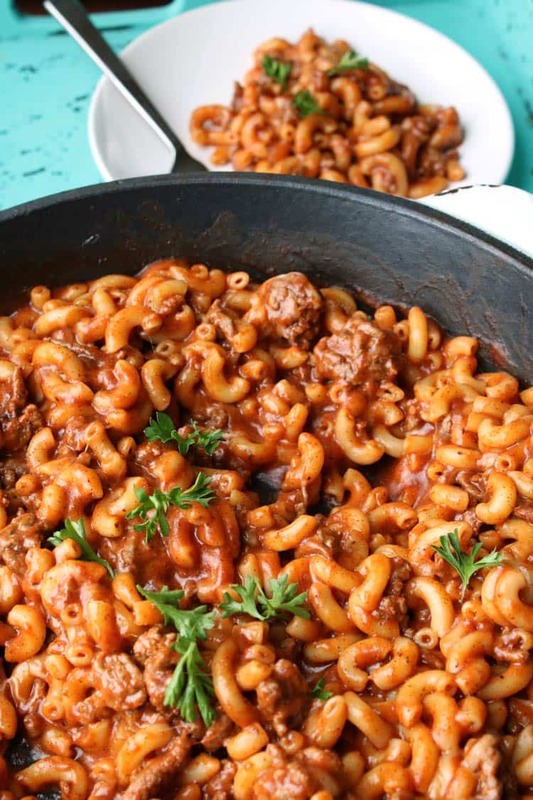 We have tried both as sides with this Chili Mac recipe and love, love, LOVE them! One of the great things about either of those bread choices is that they are great for saving for leftovers! Or, as we already suggested, serving with dinner a couple of nights in a row. If you are a bread loving family like ours occasionally is, you’ll love having a freshly baked loaf of bread baked and ready to go. And freshly baked bread…ah, that smell! The aroma of freshly baked bread really cannot be beat. It is utterly amazing. Amazing. And I say that someone who frequently drives past a wholesale bread bakery and am literally enveloped in the smells of freshly baking bread. Every single time I am stopped at the stoplight in front of that bakery, I take a deep, DEEP inhalation and say to myself (and sometimes out-loud to whomever I’m in the car with), ‘Oh, I love that smell!’. Because it is truly amazing. We love indulging in a slice of Rosemary Bread lightly toasted with butter or cream cheese for a snack. It’s really quite delicious. If I’m having a freshly baked slice of a plain white or whole grain bread, I’m more likely to load it up with butter and strawberry jam. Yum. Excited to know you’ve zeroed in on the recipe for the Best Chili Mac Worldwide? 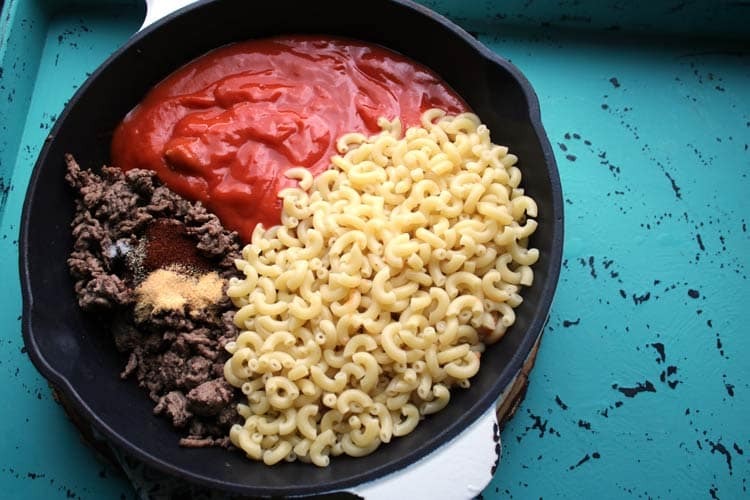 Just take a look at the pictures and you can see one of the reasons why I think this chili mac recipe is pretty extraordinary. It’s colorful, photogenic, and so, SO tasty. And really…don’t you want to eat food that is pretty enough to photograph? No? Okay…I get your point. It is WAY more important to have food that tastes good, but this recipe does BOTH! SO, I have to say that is a win. And, colorful food is always better than dull, drab food. I mean, for one, it gives you something gorgeous to look at. And two, colorful food equates to flavorful food. When you see this beautiful meal gracing your dinner table, you’ll be ready to dish up a big plate and dive right into it. When it comes to dishing up a bowl of comfort food, I’m pretty sure most of us would consider ourselves pros. Portion control is a huge obstacle for comfort food lovers, so make sure you dish up an equal portion of a salad too. Personally, I like to make sure I have enough Chili Mac leftover so I have a small bowl set aside for my lunch the next day. 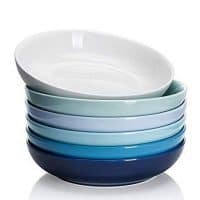 I’ll sometimes fill up a Pyrex bowl with the amount I’m going to want for lunch BEFORE I tell everyone that it is time for dinner. This serves double-duty…it makes sure that I have my lunch taken care of AND it ensures that neither myself or my family overeats. It is SO important to make sure that you have good portion control. And honestly, that doesn’t mean loading up a smaller plate and then coming back to load it up 2-3 more times. Because all you’ve really done there is manage to get a few extra steps in, and by the time you’ve had those extra helpings, you really need to take a longer hike to get the extra calories off. Now, I’m all for indulging every once in a while. My own indulgence happens to be mashed potatoes and gravy, although I’m getting better at portion control when it comes to that favorite luxury. If you’re a soda, coffee, or sweet tea drinker and want to reduce your caloric intake…or strictly your sugar intake–cut out sugary drinks! It’s not always easy, but it is SO worth it. Switch all of those drinks to water! Not only will you feel healthier, but your skin will thank you as well. I was a BIG soda drinker for a long time. Over the last few years, I’ve been back and forth with soda so many times that I’ve lost count. I still drink soda, but I’m down to 1/2 to 1 can of Coke Zero Sugar a day from the 2-3 20-bottles of regular Coke that I used to drink. And what do I drink all day? Water. I never order soda when I’m at a restaurant now, and I never accept a regular Coke, because I know that is my slippery slope. Bite by bite, our Chili Mac recipe will remind you of all that’s right in the world. There is something to be said for comfort food and you really can’t argue with it. At it’s core, comfort food is supposed to make everything feel all right. It’s supposed to (and indeed does) give you the ability to sink into a cushy chair, kick your feet up and just relax. Good comfort food, when served up right, can calm you. 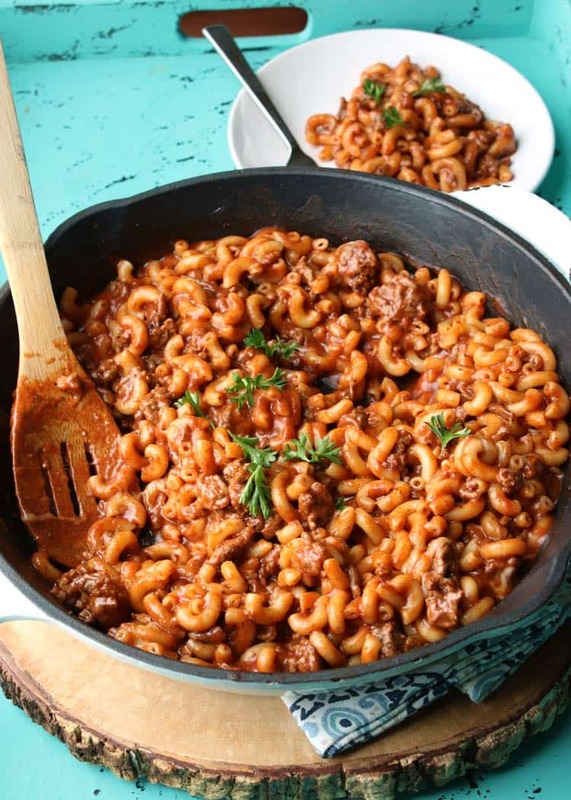 And this one-pot Chili Mac recipe? It delivers. Swap in ground turkey instead of ground beef. Use a mix of cheeses – sharp cheddar and pepper jack both taste amazing in this recipe. For those who like a little heat, add in a pinch of red pepper flakes or a couple of dashes of your favorite hot sauce. No macaroni on hand? No worries! You can make this using penne or farfalle (also known as bow-tie pasta). 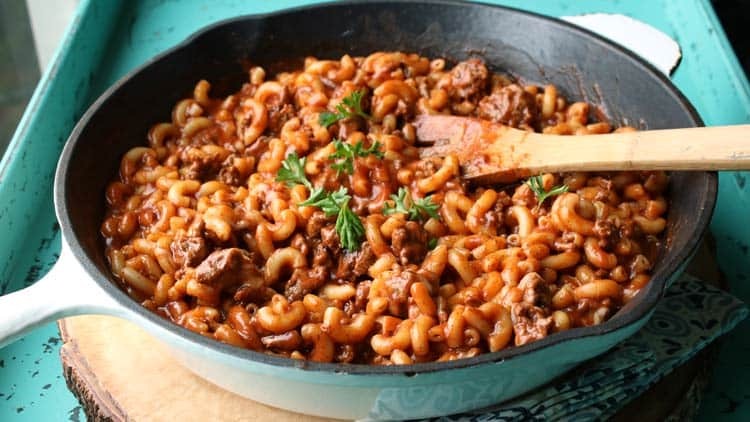 Chili Mac is one of those easy meals that people appreciate. Cooks appreciate the recipe because its easy to follow and such a simple dish to make. Families love it because it tastes good and is so pleasing. And moms and dads (yes, one or both of us are also the cooks) love it because our kids eat it up without complaining and often even ask for more. When you find a recipe that your family loves…SAVE IT. Yes, I put that in all caps and it is SO important. When your family says a recipe is good, or implies that it is great by clearing their plates and having seconds–that is a recipe worth hanging on to. If you’re not a Pinterest user, this would be a great time to hop onto Pinterest and start saving your family favorite recipes. Pin this recipe, and you’ll be able to easily come back to it again and again. I’d recommend having a few different recipe boards on Pinterest: Family Favorites, Recipes to Try and then holiday specific recipes would be a few ideal board types to start with. Comfort food recipes are recipes you want to come back to and make again and again. And there are good reasons for that! Food that speaks to your soul…er, stomach, is often tied to fond memories. Like all the memories I have of pumpkin pie. Or, my mom’s meatloaf. Or, chili. Ah…chili! Because when food makes you feel good, as good as mashed potatoes–well, you know you’ve found a winner. And comfort food typically not only soothes the soul and warms the body, it often has the ability to wrap you up and make you feel safe. 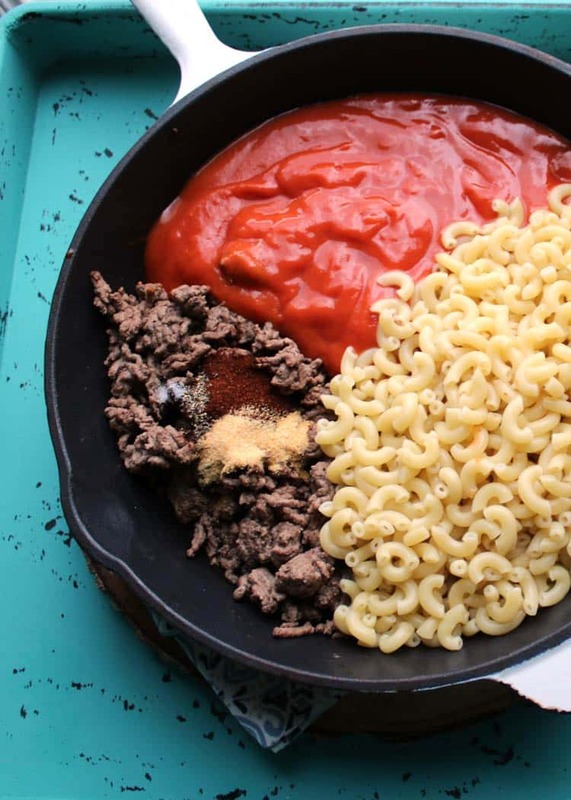 You might not think of or experience each of those individual things while enjoying a bowlful of Mac n Cheese or a great dish of Chili Mac, but I’m here to tell you, it does the trick for me each and every time! Now, your bowl of comfort might be different than mine, and your friend’s might be different than yours, but comfort is comfort. We promise. And a bowl of Slow Cooker Baked Apples with Vanilla Ice Cream for dessert? That’s an extra dose of comfort that gets me every time. If apples aren’t your thing, there are still a dozen other ways to top dinner off with dessert. Since we absolutely love dessert around here, you know you can find about a gazillion dessert recipes on All She Cooks. Like our Whipped Berry Tart, Banana Cream Dessert and M&M’s Icebox Cake. All of these are super easy to prepare and go right along with our goal of keeping mealtime prep to the point during the week. Make any of these desserts earlier in the day or a day ahead and you’ll be relaxed and ready to enjoy dessert along with the rest of the family. Yes…we love ourselves some sweets around here. We don’t often serve up dessert at home, but it is always a special treat to surprise the family with. Dessert tends to bring out the smiles. 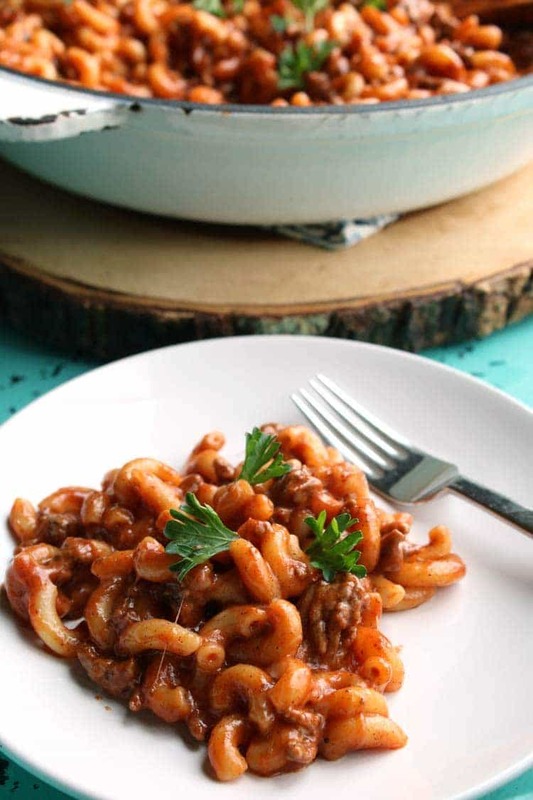 When looking for delicious meals that are easy to make at home, look no further than our phenomenally simple recipe for Chili Mac. 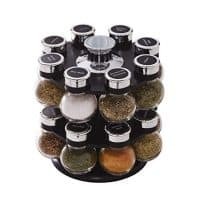 It’s comprised of just a few simple ingredients combined with spices that you likely already have in your spice cabinet. Making dinner at home should always be easy–whether you’re planning for an easy weeknight dinner or a quick weekend meal after you’ve been running around like mad on your couple days off. 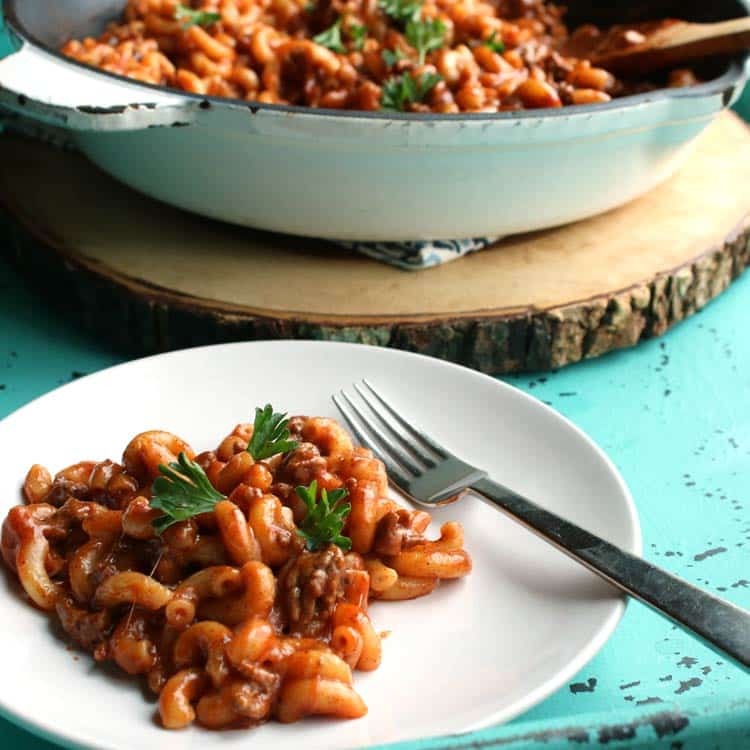 One of the reasons we simply can’t get enough of this delicious Chili Mac recipe–besides the incredible taste–is the ease it which it comes together. This is seriously one of the best one-pot meals that we have ever made. And for that reason alone, we highly recommend it to anyone who wants to save time in the kitchen at dinnertime while still getting a quality meal on the table. With our yummy Chili Mac recipe, you will still have plenty of time left to sit down and enjoy dinner with your family. And that’s what dinner time is all about! 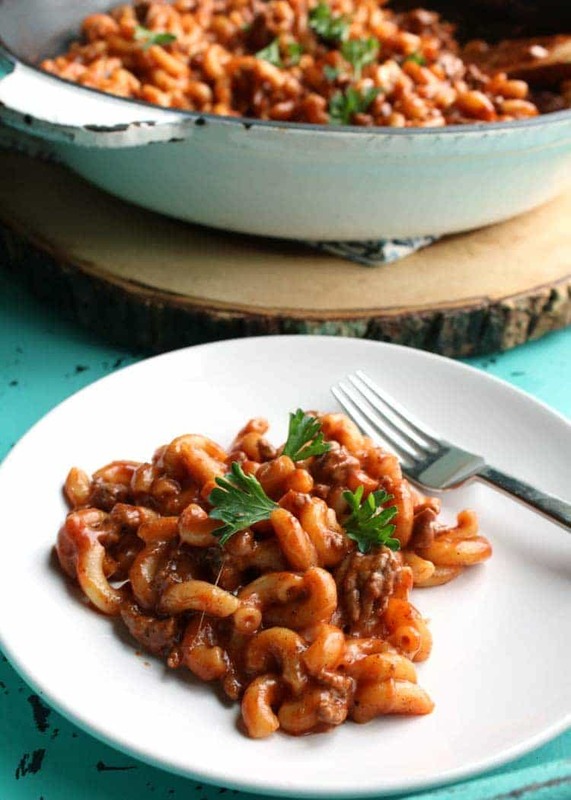 This Chili Mac recipe is one that you will want to make again and again. Be sure to save the recipe on Pinterest so you can find it later! While you’re at it, follow us on Pinterest and Facebook and don’t forget to join our Facebook group. Cook macaroni about 7 minutes. Brown meat in largest saucepan and drain off all fat. Add garlic, chili powder, salt and pepper. Mix well and cook on low about 5 minutes. Add cooked macaroni and tomato soup. Heat thoroughly. Just before serving, add in the grated cheese. Cover and heat until cheese melts. Did I miss something or did you neglect to say how many the Chili Mac recipe serves? I looked but didn’t seem to find it. It sounds really good and I plan to try it tonight. This recipes serves 3-4. Thanks! Hope you liked it. You better have several sides with this! My son would eat this whole amount, plus! How many does this serve!?! My grandma used to make this for me. I will be making this soon. Do you use condensed tomato soup (like campbells) or non condensed tomato soup? If using Campbells condensed tomato soup, do you add the 1 can of water condensed soup calls for? I just use condensed soup. HI is the tomato soup condensed or just regular ?? Want can I do if I don’t have tomato soup available ? You could try using tomato sauce, although the result will be slightly different. Is it ready to serve tomato soup or condensed? Made this tonight for dinner and my hubby and I loved it! It was easy and I felt like it was better than the “Hamburger Helper” version. Thanks for sharing! Wanting to make this but with a pound of beef. Do you suggest adjusting the recipe as follows? It should be great like that. Let me know how it turns out! I doubled the recipe and used 1 small can of tomato sauce and I can of diced tomatoes because I did not have tomato soup. I also added about 6 oz of water. Since the soup would normally have more salt I did add salt for our taste along with more pepper. My teenaged kids liked it. Hubby wasn’t home but I think he would prefer more chili powder. I will have to experiment. Overall, it was good and a quick dinner. That sounds phenomenal! I would definitely try it with cheddar. Let us know how it turns out. So good thank you! I added a little bit bit of sour cream too! This was so good!! I make my own tomato soup, so I used that. The leftovers were just as good for lunch the next day!! This is going in the rotation for sure!! Thanks!! I️ really enjoyed this meal! However, because I️ am a vegetarian, I️ replaced the meat with beans to substitute. It was delicious! I️ added extra cheese As well, but I️ wold still suggest adding more- probably vegetables. Love this recipe! Thanks Sadie! What kind of vegetables would you add? Love hearing your vegetarian options for substitutes. I honestly have no idea. There isn’t a cheese pack in the recipe so its something I wouldn’t have an idea about. This was delicious and super easy! I served it with cornbread and it was perfect for a rainy night.